Neighborhood Credit Union last year presented the 2017 Miracle Day Radiothon, which raised more than $350,000 for the eighth-largest pediatric health care provider in the nation. 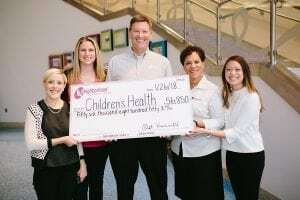 Neighborhood CU has been a longtime supporter of Children’s Health, and one hundred percent of the funds raised over the 13-hour period will benefit Children’s Health. Neighborhood Credit Union also presented Children’s Health with a check for $56,850 as a result of its Skip-A-Payment program. Neighborhood CU, during the holiday season, allows its members to skip a loan payment in exchange for a small donation. The money raised from the Skip-A-Payment campaign is donated directly to Children’s Health. Children’s Health took Neighborhood CU Leaders on a tour of hospital facilities in order to show how donations provide the best level of care and service to our patients and families. -Chet Kimmell, president and CEO of Neighborhood Credit Union.